I receive unsolicited prize giveaways in the mail all the time, mostly from regional auto dealerships trying to promote their inventory and overstock. The tactics used to entice the recipient into reading and reacting to the send-out can be both entertaining and aggressive. The goal of these mailings is naturally to maximize consumer response and get as many people as possible through the doors to sell them vehicles. For this reason, everybody wins! 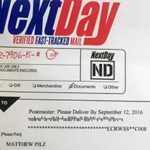 Some dealership promotions come enclosed in very important looking "NextDay Verified Fast-Tracked Mail" envelopes designed to mimic actual overnight services while still being sent regular media mail (complete with handwritten jargon about there being crucial documents inside.) Others come with a generic key that must be checked against a lock box at the dealership. Almost all of them include some variant of a scratch-off or pull-tab ticket with some fantastic prizes on the table. If you receive a flyer for any sort of event within 25-100 miles of your address and it includes any gambling-inspired game for you to "play-to-win", rest assured you will be a "winner" every time. The majority of marketing flyers that I receive, as sensational as they are, have still been honest in their identification of what you've won, the fine-print and the abysmal yet accurate odds of winning any of the non-trivial prizes. By that, I mean that at least 99,997 of 100,000 send-outs will contain the same identical winning ticket and its value is typically not worth the money in gas to claim. Assuming they send out 100,000 flyers and are true to their word, only three of those 100,000 stand to win anything beyond a couple dollars in cash or a restrictive gift card. 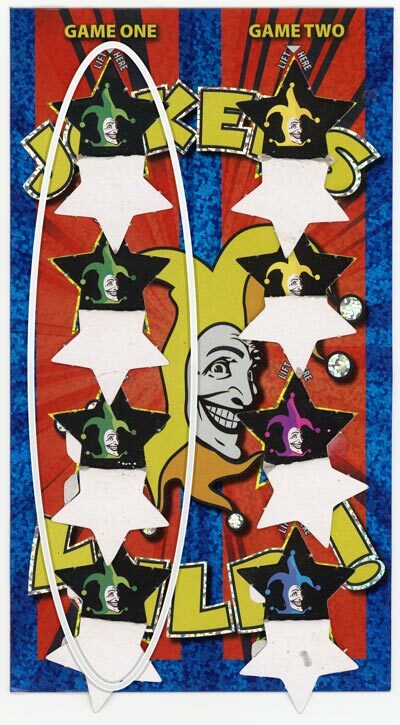 In these more honest flyers, you scratch off the play area or otherwise reveal that you have a winning ticket, such as by matching three like symbols in a row. Comparing the ticket results to the prize legend will inevitably reveal that you have won $2 or something of similar monetary value. To claim it, you must visit the dealership during the aforementioned promotion. I arrive at the dealership to a hoard of salespeople roaming about. Immediately I walk past the crowd and into the tent. I show a staff member my winning ticket and advise them I am there to collect the prize (all $2 of it). The salesperson says he will go get the cash but it could take awhile and suggests I look around the lot while waiting. I respectfully decline and tell him I'll just wait right there. Minutes pass and eventually he comes back with a crisp $2 bill. I thank him and start to leave. "But before you go, " he remarks, "we are having a $500 giveaway tomorrow and it is free to enter, interested?" "Hmm, OK?" - Now I'm on the hook. He tells me he just needs to take down my information so I can be reached if I win. I am now put through a fairly rigorous survey that asks everything about my current vehicle, what kinds of vehicles I may be interested in, what my financial abilities are for loans, how much I could afford a month and so on. After repeatedly insisting that I am unwilling to put anything toward a new vehicle at this time, despite how low of a figure he goes down to and how much he talks about them having the perfect vehicle for me, he finally concedes and ends the survey. I leave (and no, I did not win the prize). All told, it took around 15 minutes to claim my $2 prize and over a half hour until I was finally out of there after entering the large cash giveaway (which, like most free things a person signs up for, probably also resulted in more marketing materials coming my way). If you live less than a mile away from one of these dealerships and don't stick around past receiving your small monetary prize, and have some time to kill, you can almost break even. 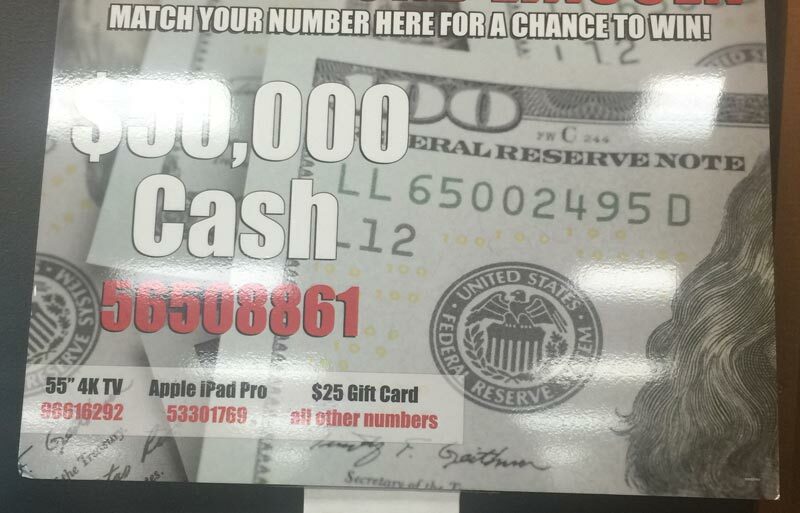 Some promotional flyers I receive are much more misleading about the alleged prize won. With these types of marketing materials, all indications are that you have won a significant prize and that you are one out of 100,000 to get so lucky. 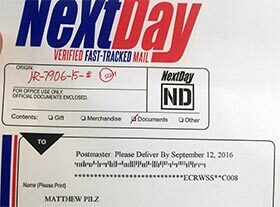 I will give a detailed rundown of a recent flyer that I received and acted upon. JOKERS WILD MATCH TO WIN! 2 CHANCES TO WIN! 2 GAMES PER CARD! OVER $2,500,000 IN AVAILABLE PRIZES! This flyer came with a pull-tab game not unlike those you'd see in the corner of a tavern. As you can see, this prize giveaway is so extreme that it has to be "QR CODE PROTECTED," whatever that actually means (it's a 40 character string that I suspect is identical on everyone's card). The prize legend seems pretty straight-forward, as depicted below. The prize, odds of winning and verifiable retail value are listed for each of the four rows. Simple math confirms that everybody is a winner. 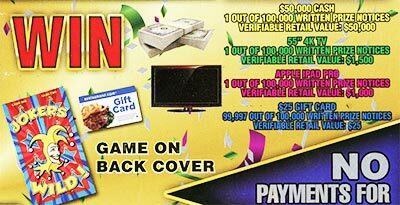 There is a 99.997% chance of winning the $25 gift card, which means that this is the prize all but three people of 100,000 will win. It is identical to the $2 odds in the previously described giveaway. The remaining three, with a 0.001% chance each, will supposedly win either the cash prize, iPad or 4K television. Four green jokers in one game! Yes! Surely this means I won the 4K TV, right?! It seemed pretty apparent from the legend that this was the case, at least. So excited was I about this win (OK, there might be a hint of sarcasm there), that I got in touch with a friend to share the great news. "Well what do you know? I got the same matching green jokers in game 1! In fact, our cards are identical for both games." "How could this be," I thought. Only one person in 100,000 was supposed to win the 4K television, and the odds of that happening were astronomically low. I skimmed over the the fine print. Did it require us to purchase a car before claiming the prize? "NO PURCHASE NECESSARY TO ENTER OR WIN. PURCHASE DOES NOT INCREASE CHANCES OF WINNING." Apparently not. I dialed up the number on the front and entered my confirmation code as it instructed me to do. Rather than getting any confirmation about my prize, the automated machine instead began asking a series of questions relating to the purchase of a new vehicle, special loan rates etc. I hung up. There was one other line in the small-print that caught my attention: "Bring invitation to event location to compare your confirmation code to prize board to determine your prize." Unfortunately, it would be nearly a 100 mile round trip, completely out of my way from anything, to get my prize. Still, the 4K TV would more than make up for the loss of gas and time (again, maybe a trace of sarcasm here). So, after printing off some relevant state statute codes on prize giveaways, off I went. Here is a rundown of what happened when I went to claim my 4K television that the prize legend suggested I had won. I arrive at the dealership, park and walk in. For an event that professed "overwhelming response" and imposed a strict "1 vehicle per family" rule in their marketing, they sure had a lot of cars for sale, and not many visitors. I go up to the counter and tell the employee or manager that the legend indicates I won a 4K TV with the green jokers and would like to claim the prize. He says "give me a minute and we'll see what you've won." So I wait patiently, while pointing out once again that all indications from the flyer is that four green jokers would win a television. Before confirming my prize for me, I was told to take a seat at a table and wait. Eventually he came over and began giving me the same sort of survey that all the others give about my current vehicle, what I'm looking for, etc. I again advised him I was not looking for any vehicle nor would I be purchasing one, but I was there to claim the prize. ME: Looking at the legend, you can see four greens equals win–55" HD TV right? DEALER: Well, all green can win this, can win this, can win this... All the color codes, sometimes they're all yellow, sometimes they're all purple, sometimes they're all green... You can win any of these prizes, not just that. ME: I mean, do you see the misleading part here then? DEALER: Well, this was sent to the state attorney's office before it was sent to you, and they had to OK it. After more than five more minutes of back-and-forth, he asked if I was looking to buy a new car. After telling him "no," we finally get up and go to the "prize board" to compare the code. My code shockingly did not match any of the big listed prizes, including that for the TV. Instead it fell under the "All Other Numbers" section for the $25 gift card. So that's it. By adding the clause that the actual prize is determined by the prize board, and despite heavily suggesting that four greens equate to the 4K TV, it seems dealerships are able to scrape by the legal standards required to send these out. 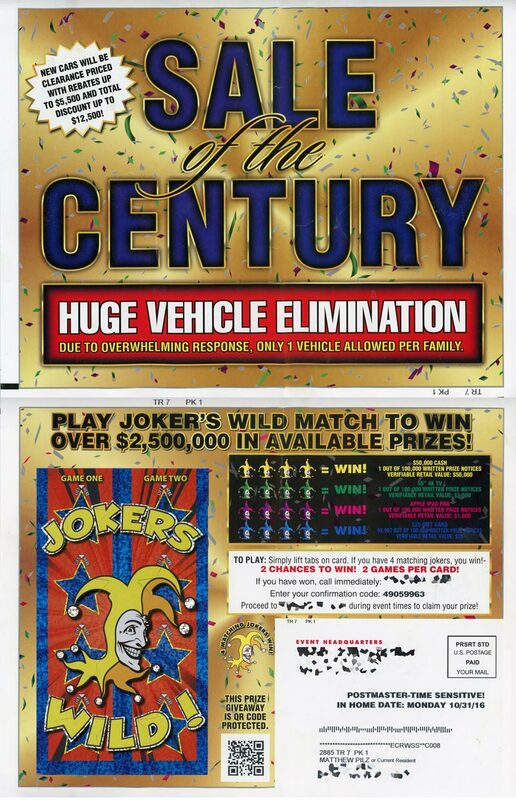 If you are curious about where dealerships purchase these sort of flyers, check out store.cheapautomailers.com for one example, which sells a massive variety of scratch-off, pull-tab and other "game winning" flyers for dealerships in bulk for pennies a piece (with 10,000 minimum in most cases). One should question, however, how unscrupulous a company might be when they rely on sensationalism and deception to get people through their doors in the first place (and when they justify said actions merely because the state attorney cleared them). If the flyer was this misleading, I would believe that any deals brokered with the same company would be equally suspect. Others feel the same way, based on the steady stream of 1-star ratings this company received in the days and weeks immediately following this "promotion," totaling nearly half of all reviews received since their inception and dropping their overall rating substantially. Curiously, even if the number from the flyer did match, this prize board suggests that you would still only have "a chance to win" the listed prizes.